For over twenty years excavations of ancient Tiberias have been underway. This section contains photos of some of the structures excavated. The City Gate and Theater have a special section. Herod Antipas was the son of Herod the Great who ruled Galilee from 4BC to AD 39, beheaded John the Baptist, and before whom Jesus appeared in Jerusalem before his crucifixion. 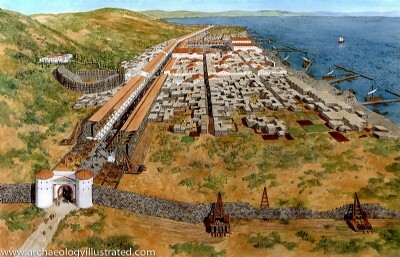 He built Tiberias from AD 18 to 22 naming the city after the Roman Emperor Tiberius (17–34). Then he moved his capital from Sepphoris to Tiberias.